Home, sweet vacation home! This blue-cedar-shingled charmer offers a welcome so big and warm; you may harbor fantasies of staying on well past your checkout date. 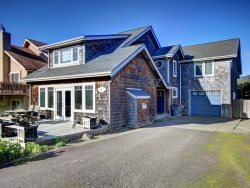 Located at the edge of a small forest just two blocks from the beach and one block from downtown Cannon Beach, this three-bedroom, one-bathroom house is ideally equipped for families seeking comfort and convenience in equal measure, in a location that’s set just far enough back from the crowds. That comfort begins right in the front fenced yard, where a classically coastal porch comes outfitted with beautiful lounge chairs — the perfect place for welcoming in another fresh coastal morning in total peace and quiet. Indoors, the cozy cottage ambiance belies a surprising amount of space in which to move about. The main floor includes a lovingly outfitted living room furnished with plush couches, a flatscreen TV/DVD, and a lush carpet, all offset by gorgeous blue accent walls and lively, ocean-themed décor. Nearby, a bright, well-stocked kitchen offers a breakfast nook and a washer/dryer, and when evening comes, the connected dining area is the perfect spot for gathering to fill tummies while catching up on the day’s adventuring. On this level, you’ll also find a bedroom with a king-size bed and a full bathroom. Out back, you’ll be smitten with the yard and secluded deck, where sturdy picnic tables and serene views await. And keep those eyes peeled: you might well catch glimpses of passing elk herds through the trees. Back indoors, head down a small set of stairs to reach the cottage’s lower level, where a gorgeous bedroom with queen bed and a sitting area awaits, offering a television, a sleeper sofa, and yard access. On the home’s top floor, kids will delight over a fantastic hideaway in the form of a classic dormer with two twin beds and a queen bed. Convenience, comfort and just the right amount of coastal solitude —this classic cottage offers the best of all three worlds. Just one visit is all it may take for Cannon’s Cottage to become your family’s new favorite vacation home away from home. Visit CB is our family's favorite Oregon coast rental agency. They are always friendly and accommodating. We love the gift bag too. We've used you the last two years but, also in the past on occasion. The experience has always been great, courteous, helpful and accommodating. Cannon Beach Vacation Rentals has become our go to rental company. You know you will be taken care of. Every detail has been thought of. Great experience. Very impressed with how much the staff cared about my experience. Friendly and called me in advance. It is a cozy home with nice neighbors and a close walk to the beach. You guys are awesome! Unfailingly helpful, efficient, and kind. We enjoy working with CBVR. It's a team of wonderful, kind, and hardworking individuals. Each team member, has an authentic positive attitude, and is always ready to make sure our questions, or specific need is taken care of. This CBVR team understands the true meaning of of guest services. Thank you!! Our family has been vacationing in Cannon Beach for 20 years. It's our favorite place to make amazing memories, and Cannon's Cottage is a part of those memories. It's a charming, cozy, quiet, well kept home with a great yard for our little dogs. Excellent location to the beach and town. We love Cannon Beach, and Cannon's Cottage!! We'll be back in 2017!! The place was spotless! Kudos to the cleaning crew!